The weather conditions in Michigan over the last week have not exactly been conducive to building cars (or even leaving the house at all really.) Last week we were hit with a decent ice storm that canceled school for my daughters for two days, only to be hit with a snow storm and bitterly cold temperatures this week that resulted in school being canceled four days straight. It was -6º this morning but without any wind, so I guess they determined it was safe for the kids to go to school again. What a crazy couple of weeks. Winter took a while to get rolling this year but we are definitely in the thick of it now. With temps dipping as low as they have lately, I haven’t had too much willpower to make it out into the garage at night. I am definitely motivated to work on the cars, but it just isn’t worth it when it’s that cold outside. I did manage to get a few things done before the really cold temps hit though. It’s so nice to assemble the turbo and exhaust manifold when the engine is out of the car. 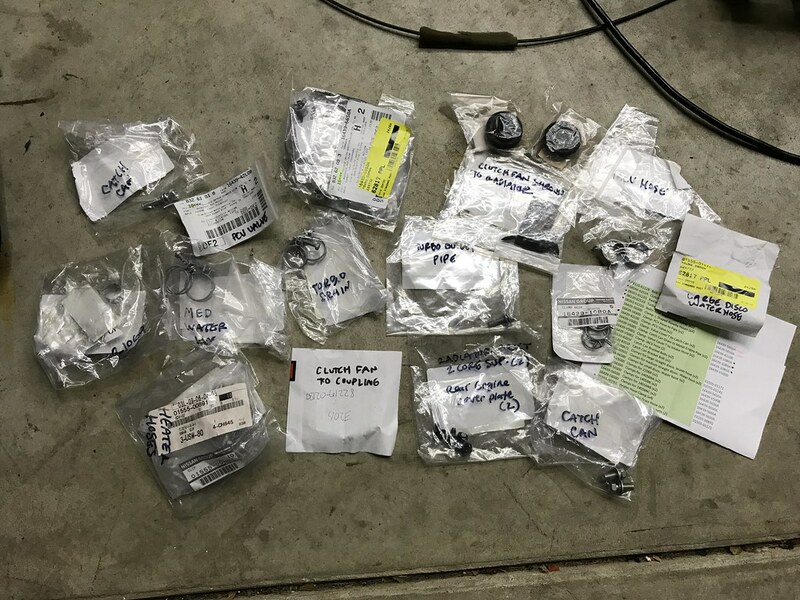 I’ve slowly been working my way through a number of the OEM items I ordered and helping them find their way onto the engine. A couple weeks back I finished cleaning the engine up and started installing things on the hot side. I hit the exhaust manifold with a quick coat of paint that will likely discolor once it gets up to temp like it did on my other SR, but I am planning to cover it with a brand new heat shield from Nissan anyway. 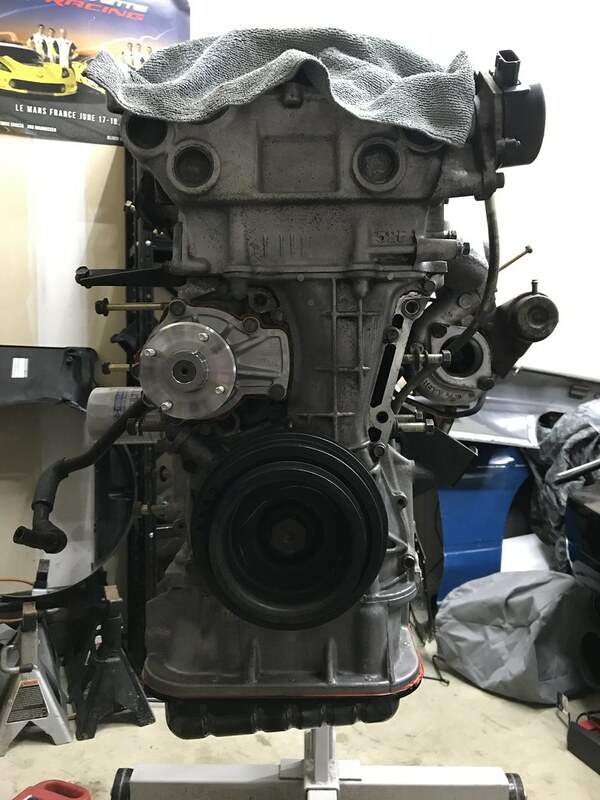 I mounted up the turbo with fresh gaskets, locking tabs, and hardware before bolting the manifold to the head with the proper OEM nuts and washers that were absent when I removed the Megan turbo manifold that came on the engine. It looked to have been assembled with a mix of random hardware so that needed to be corrected. 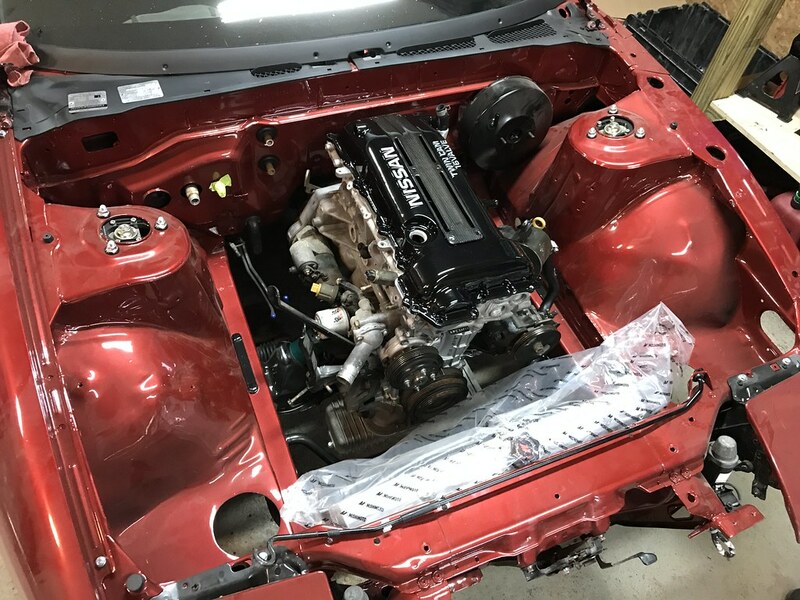 Still waiting on some OEM hardware to replace missing or random items that came on the engine when I got the car, but the hot side is more or less coming together. With the turbo assembly largely in place aside from the hardware and other items I was still waiting on, I removed the crank pulley to clean up the front cover behind it where the front main seal had clearly been leaking. I finally picked up a seal puller and was able to make quick work of replacing the front main seal, cleaning the crank pulley, and reinstalling it. 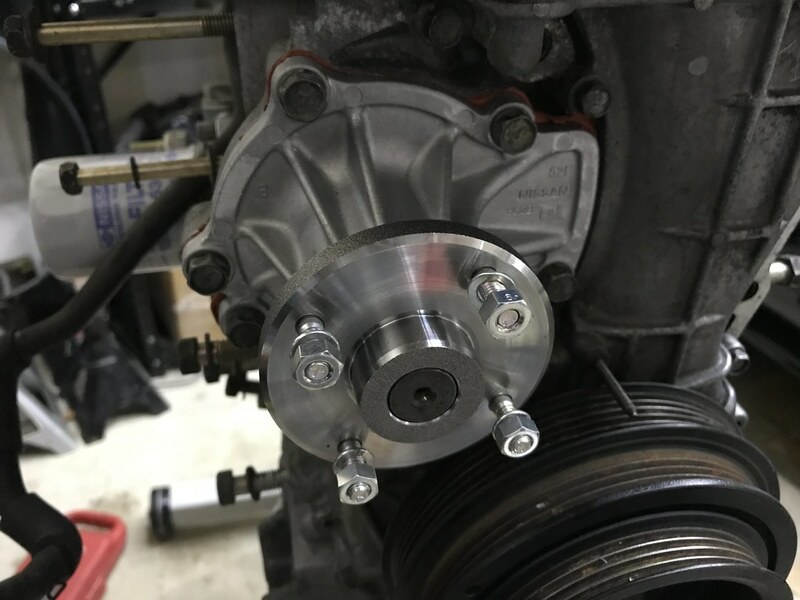 I would love to replace the entire oil pump and front cover assembly like I did on my first SR many years ago, but I am trying to keep this a simple refresh like I did on the SR currently in my hatch. It’s easy to get sucked into going crazy, but I am trying to keep a level head about it and find a good balance. 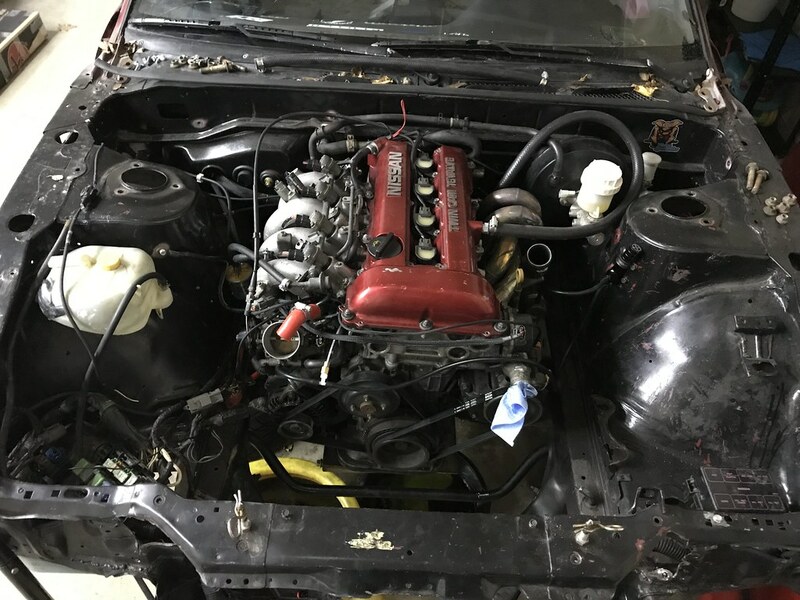 Nissan revised the oil pickup design on the later SR20DET engines- always a good idea to replace yours if you’re working on an S13 SR.
To my surprise, I found that a Tomei oil pan was installed on this SR when I removed it from the coupe. While it was a super nice piece, I decided to part ways with it in favor of a stock oil pan. I ran an oversized GReddy unit on my car for many years but recently decided it’s probably not needed for a casual street car. The issue of oil starvation always worried me, but I don’t really do any aggressive driving to deem a large pan necessary in my opinion. 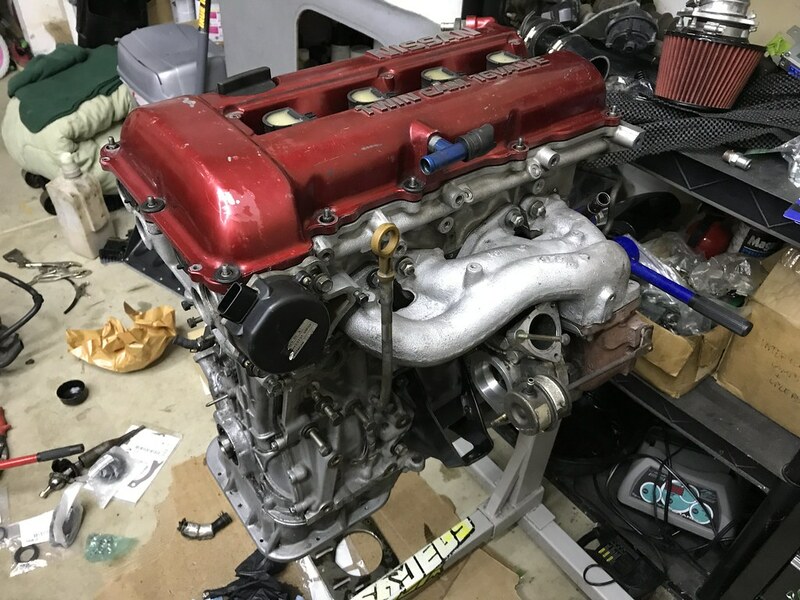 I installed a new S14 oil pickup and gasket on this engine along with an OEM oil pan and fresh hardware from Nissan. It’s a shame the RTV Nissan provides is orange and not gray or black, but I decided to just roll with it this time around. I’m not really looking to win any “Best Engine Bay” awards with the PS13 build- I just want it to look relatively tidy and stay reliable. 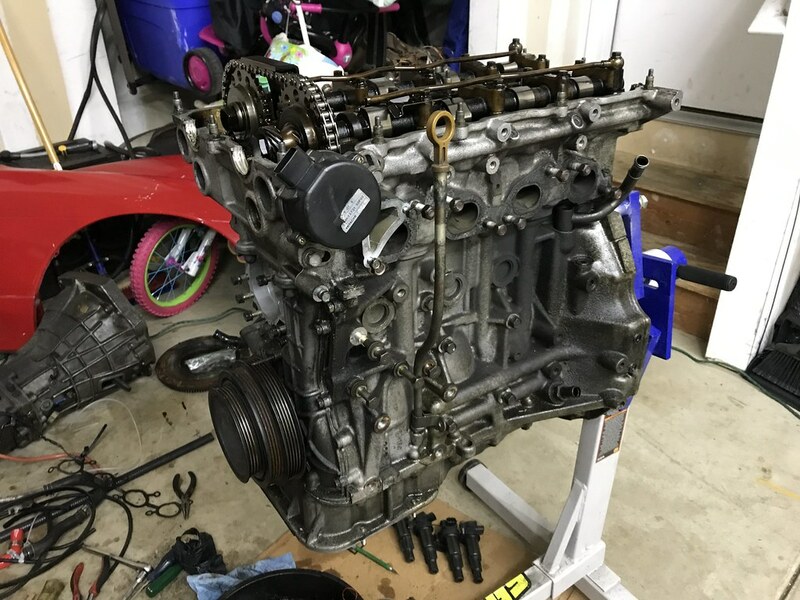 I next turned my attention to the water pump and installed a new OEM unit along with the proper studs, washers and nuts from Nissan. Oddly enough, I had to source the nuts from Japan as they were discontinued stateside. I’m sure I could have easily found something at the hardware store that would work, but I love to use the factory stuff whenever possible. Also note the freshly installed OEM oil filter in the background. The engine overall could probably be cleaner, but I am content with it for now. Most of it will be hidden once installed anyway. I just wanted to get it clean enough to spot any potential leaks once it is up and running. At this point, this is more or less how the engine sits. I’ve been waiting on some replacement hoses from Japan to arrive to get started on the intake side of things, but I should have just about everything I need (knock on wood) by next week. It’s supposed to warm up here quite a bit over the next three days so I am looking forward to being productive in the garage and making some more progress. I sent my valve cover out for powder coating, so hopefully that will be back relatively soon as well. I haven’t done much with the transmission yet, but I should have all of the remaining refresh items that I wish to get into here by early next week. I did manage to install a fresh gasket and the OEM shifter base plate I sourced to replace the ISR short shifter that came on the car though. I also removed the output seal but have not installed the new one just yet. I’ll likely focus more on the transmission side of things once the engine is completely back together. I fell a bit behind on documenting my progress so things have become a bit jumbled, but these are a few of the different parts orders that have arrived in the last couple weeks. 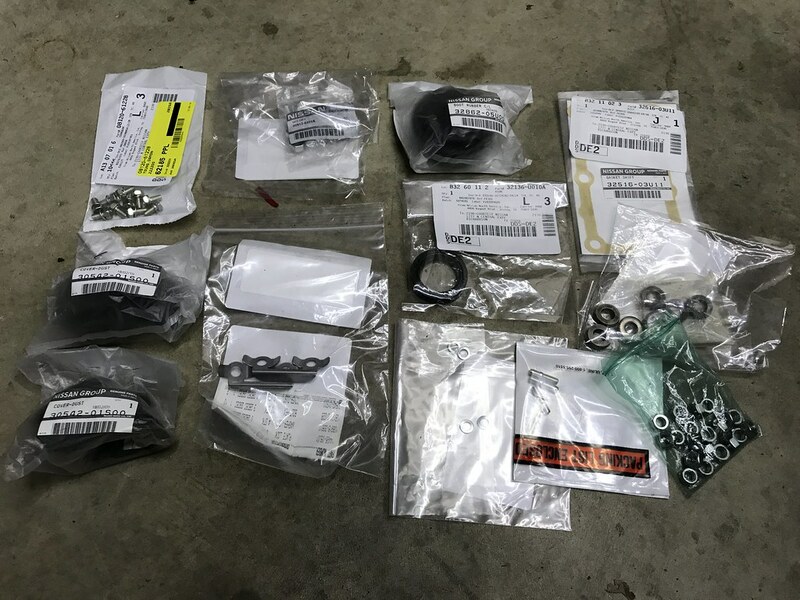 I have primarily been sourcing the more common SR rebuild items from NissanParts.cc, while usually ordering all of my hardware and more niche OEM items from CourtesyParts.com. 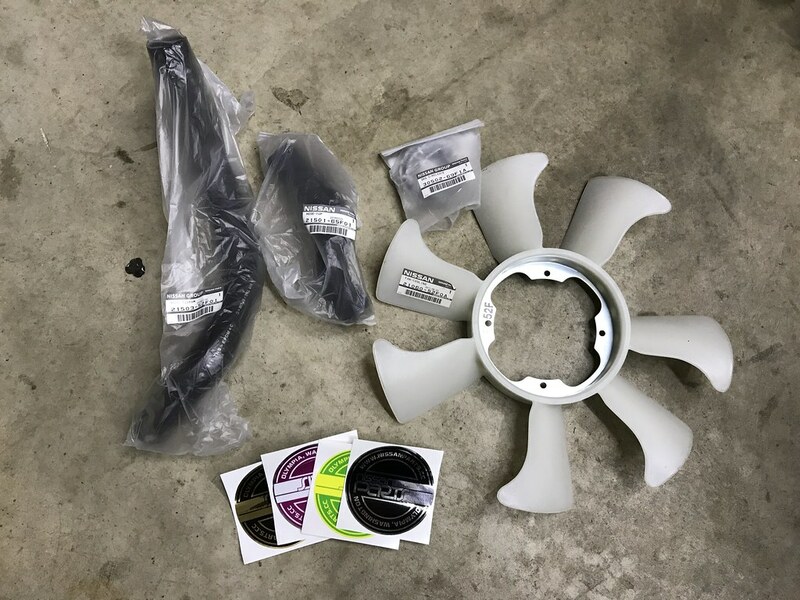 For any SR specific items that are fairly less common, I have been sourcing them from the RHD Japan OEM Store. 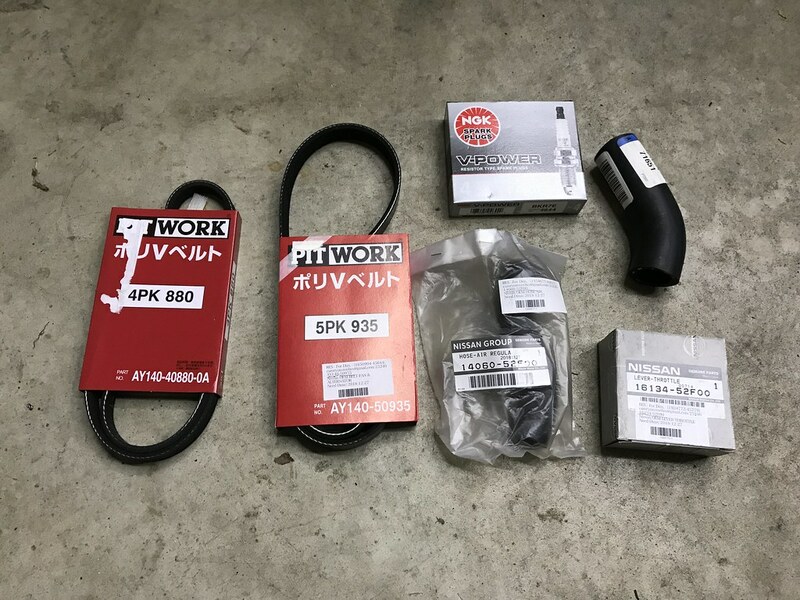 The first shipment from RHD Japan included new alternator and power steering belts, the idle air control valve hose that runs under the intake manifold, and an OEM throttle pulley to replace the GK Tech unit that was installed on the engine when I got it. I also picked up a couple items stateside- a set of spark plugs for the engine and a large coolant hose to replace the unit under the intake manifold. It’s not a perfect fit and will need to be trimmed slightly to fit, but I found that the OEM one was discontinued in Japan. 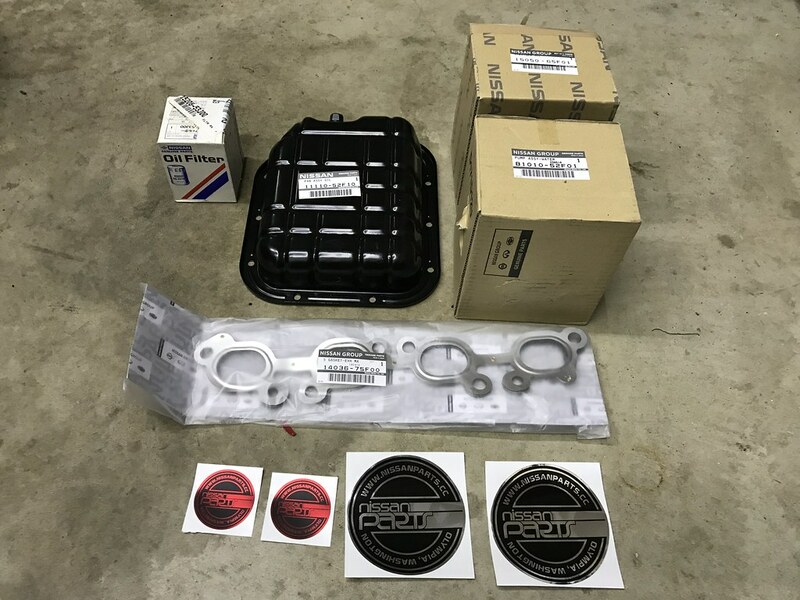 The next batch to arrive was from NissanParts.cc and included a few items that I missed when I ordered my gasket kit- a turbo inlet pipe gasket and S14 oil strainer gasket. 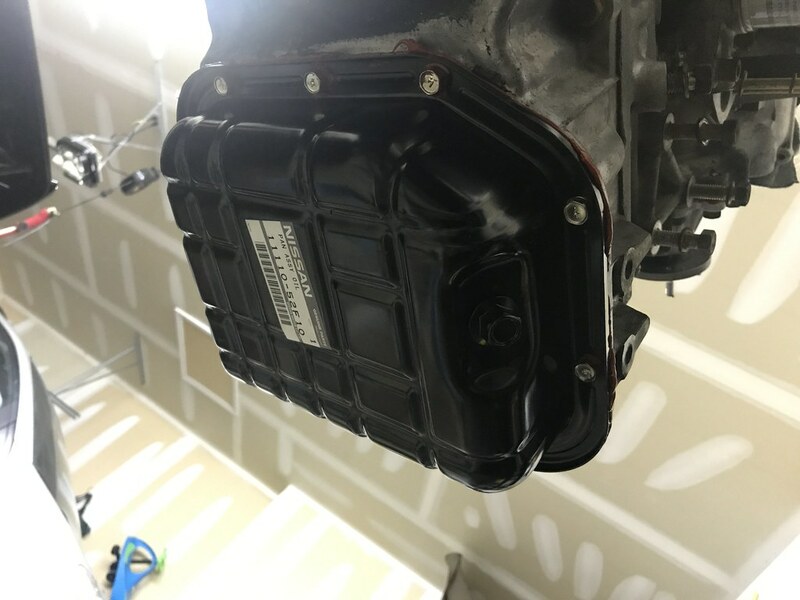 While they had a sale running I also ordered a brand new coil pack cover with OEM hardware and a replacement PCV valve to install when the valve cover is back from being powder coated. 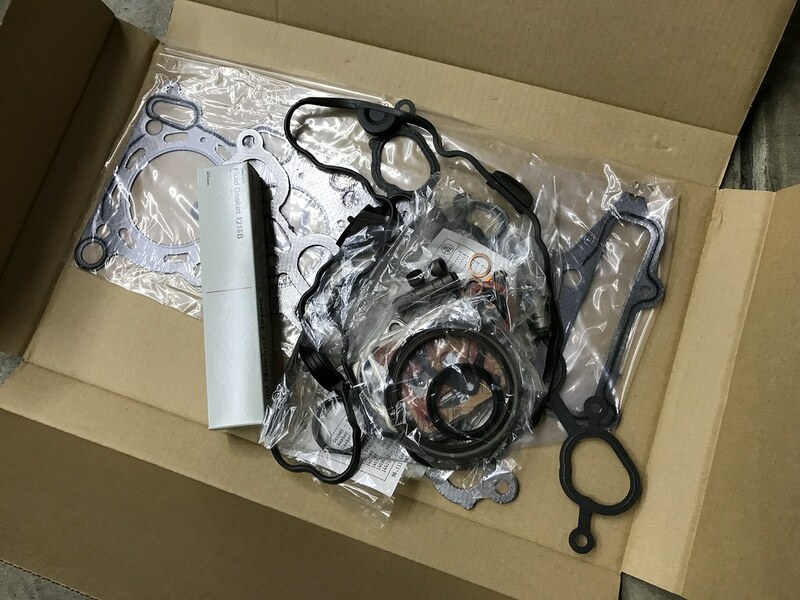 The last order to arrive from RHD Japan took nearly a month due to one of the items taking a few weeks to make it to their facility before the order could be shipped. 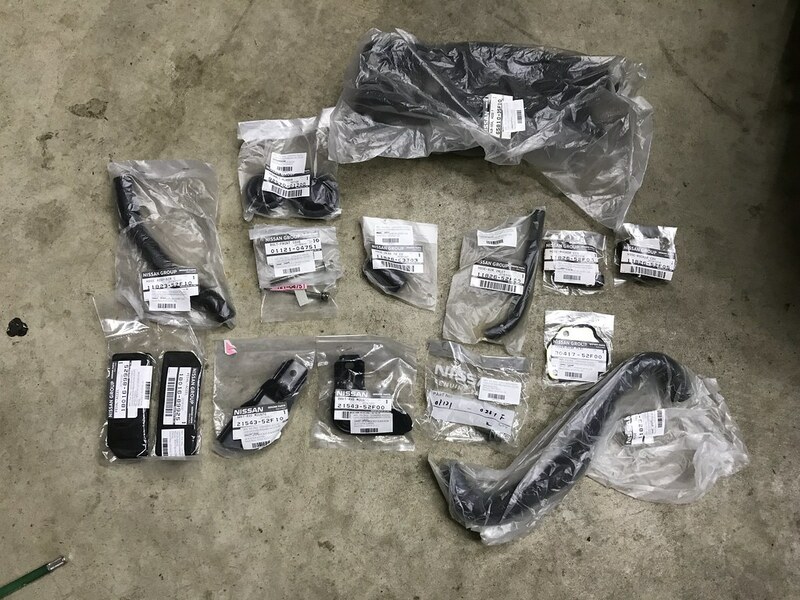 This batch included three different water hoses that run under the intake manifold, as well as the two water hoses for the IACV. 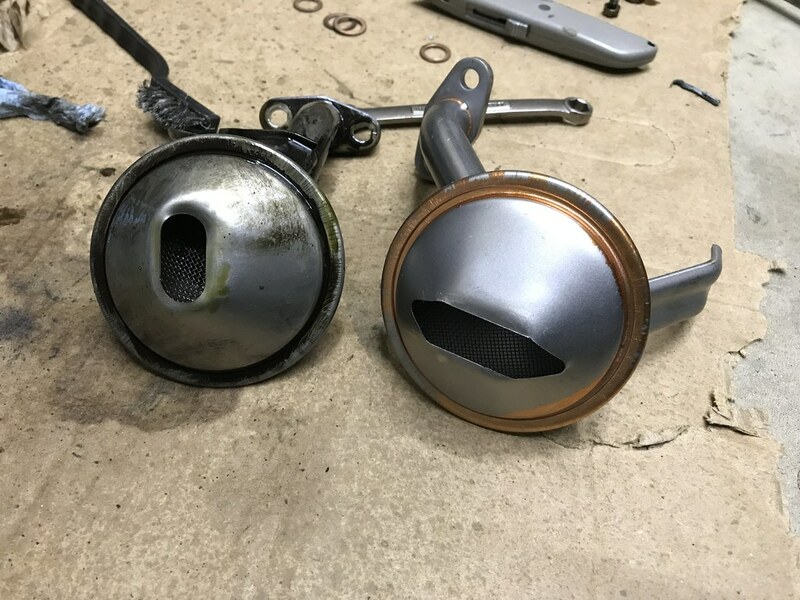 I was really excited to get my hands on the actual Nissan replacements for these as I have always had to come up with my own solution in the past or reuse the old hoses (which always concerns me a bit.) 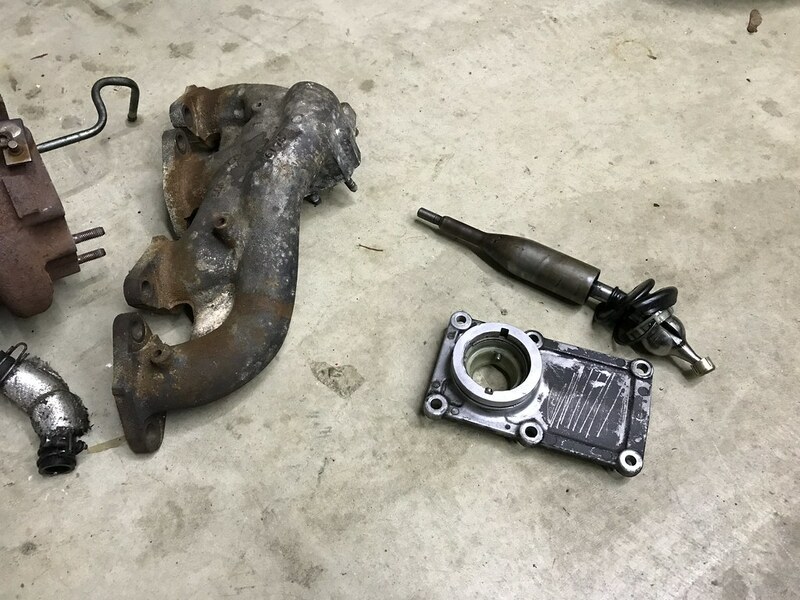 Also included was a turbo drain hose for the hot side, heat shield for the turbo manifold, nuts for the water pump assembly, and the exhaust bracket that mounts to the transmission mount. I was glad to find this piece as it has been discontinued in the states and is essential to a proper exhaust install. 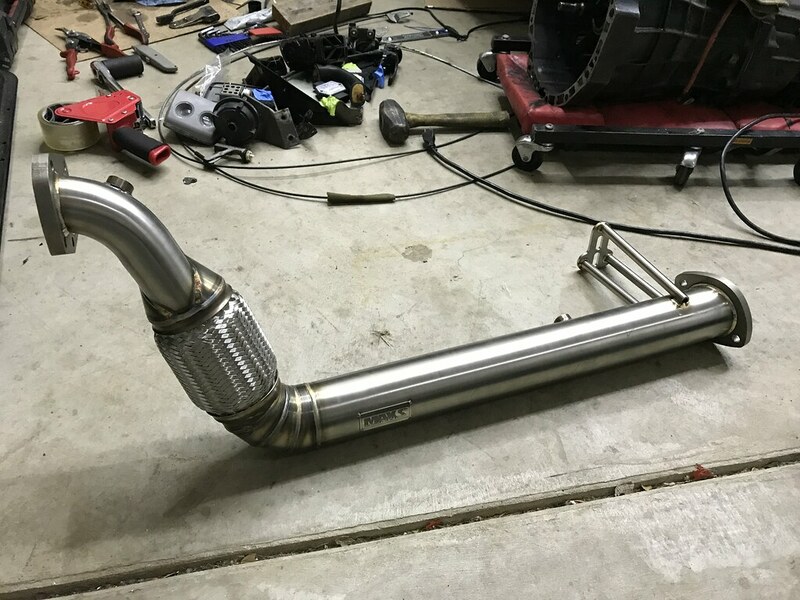 Speaking of exhaust, I found a great deal on a Parts Shop Max Cobra downpipe and I couldn’t pass it up. I’ve been planning to run one of these on the PS13 just like I do on my black car, but wasn’t going to purchase one until later when the car is close to being fired up. I was able to save so much over retail pricing on this brand new unit that I had to snag it while I could. 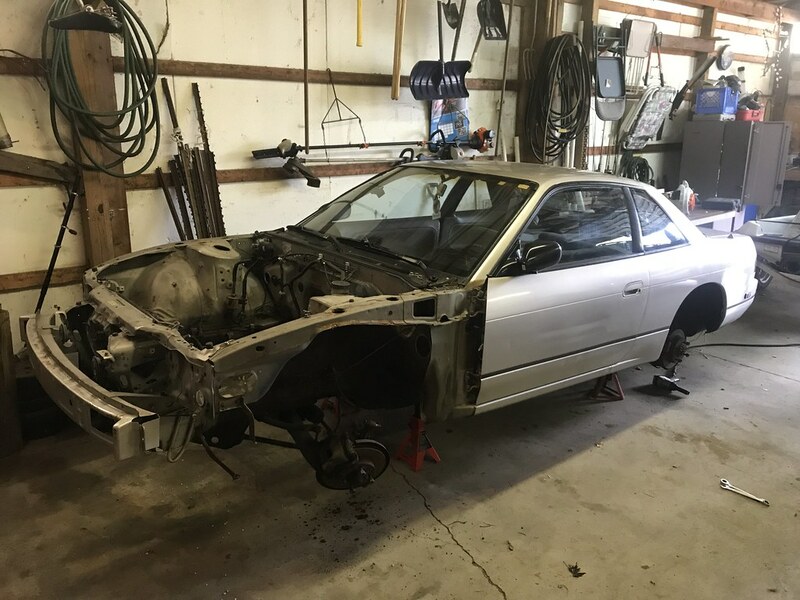 And finally, about two weeks ago I was able to sell the donor car as a mostly stripped rolling chassis. I was thankful someone was able to come and pick it up rather quickly and without much fuss as this allowed me to put my wife’s van back in the garage before the really nasty weather hit. 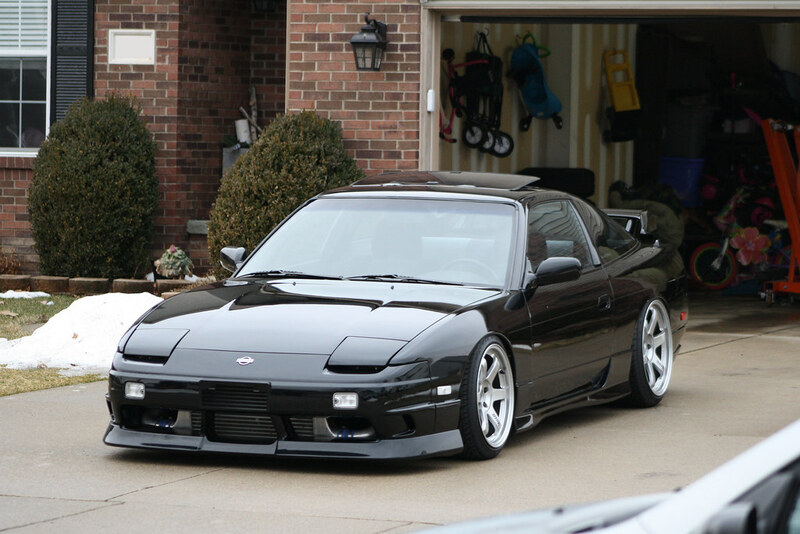 I still need to sell the wheels and tires from that car, but otherwise all of the items are gone and cleared out of my garage. I’m really thankful for how well buying and parting that car worked out. 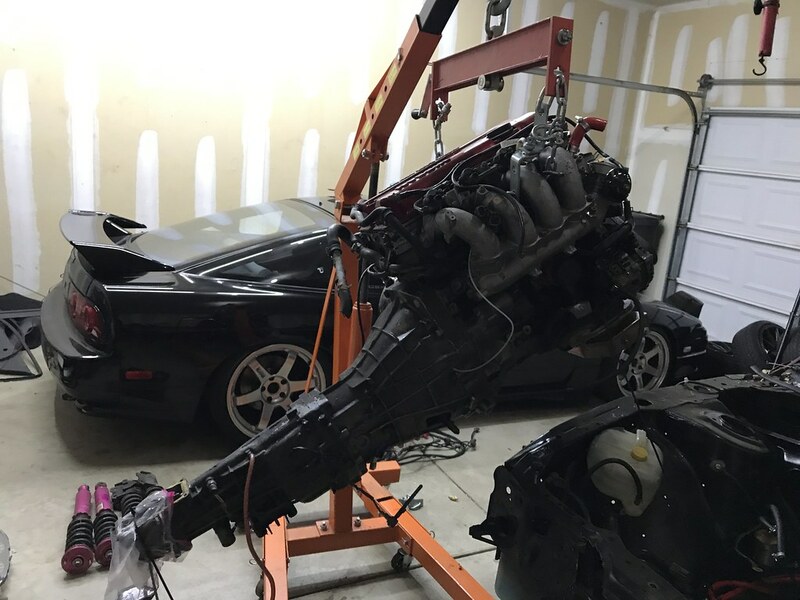 I never anticipated having a complete drivetrain for the new PS13 build so quickly, but things could not have worked out better with buying and parting out the donor chassis. Sometimes things just fall into place! So there you have it! That’s where everything stands with my garage at the moment. 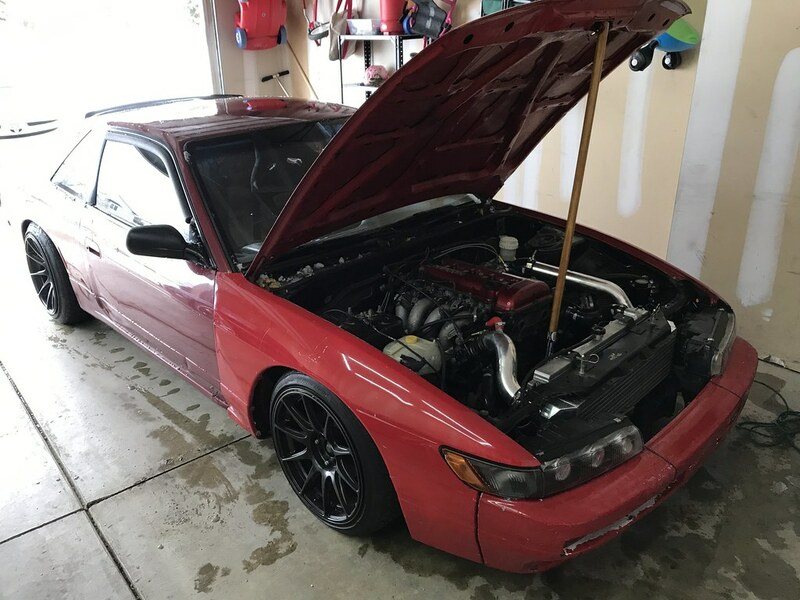 I’m looking to harness the mild weather this weekend in order to get organized and make some more progress on the PS13 SR20 setup. February and March are typically the most difficult months to make it through here in Michigan, but I’m feeling pretty motivated. Thank you as always for reading the blog- I appreciate the support! Have a great weekend. 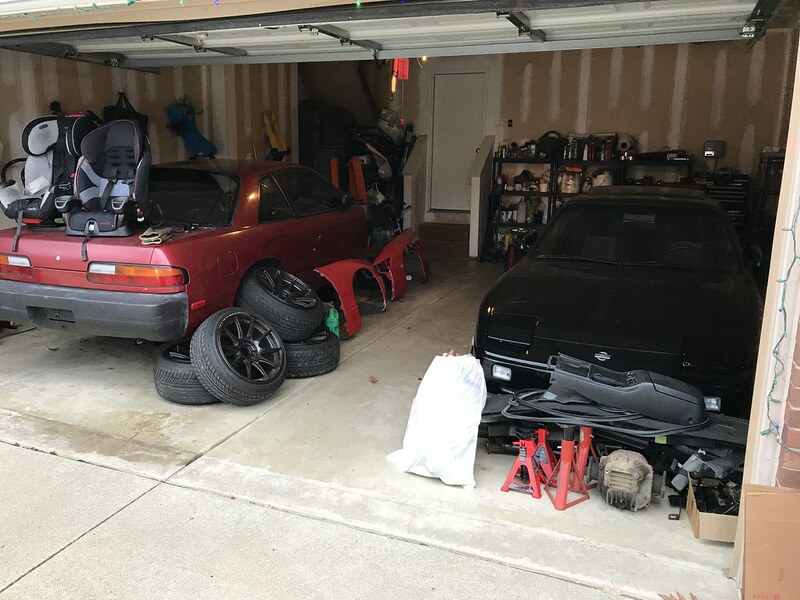 Last Saturday morning I drove an hour and a half away to my friend Tim’s house to hang out with him and another S13 owner/friend of ours named Greg. I have known these guys for a really long time and we have all been tinkering with these cars for about a decade now, so we always have a good time when we get together. 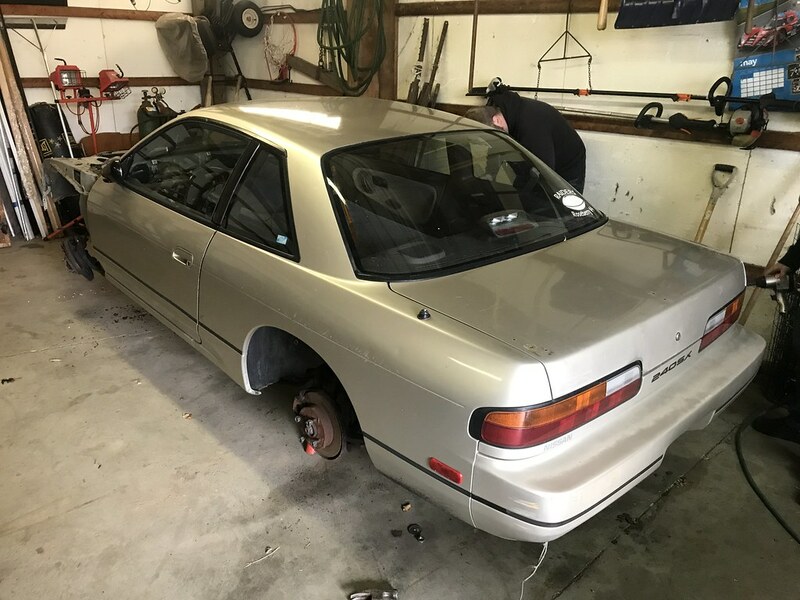 The first order of business was to travel out to Tim’s parents’ house where my PS13 chassis is currently being stored to remove the stock wheels and suspension. 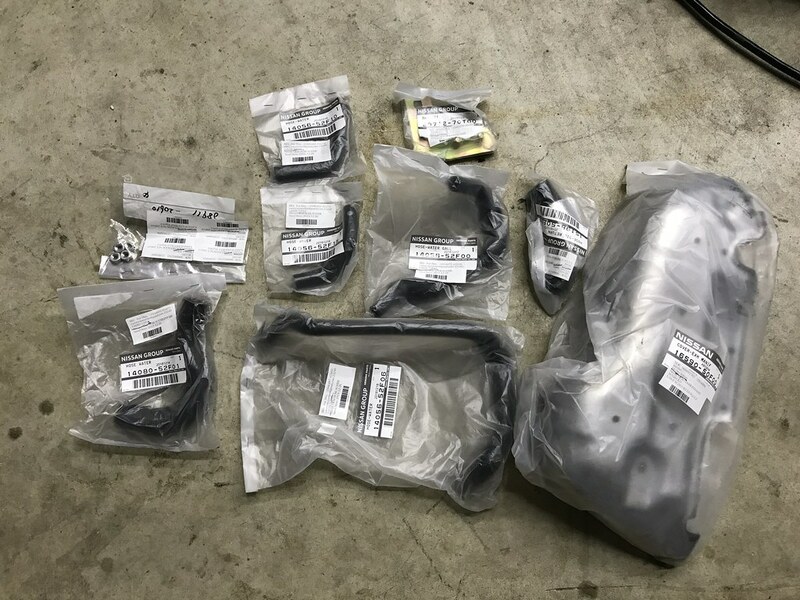 I needed to grab these items to install them on the red donor coupe I recently parted out so that I could sell the complete chassis as a rolling unit. It would have been a lot easier to leave these items in place for when I eventually transport it to my home, but selling a shell is a lot easier if it can be rolled. I unloaded a number of black interior items I have acquired into the coupe for storage purposes while Tim and Greg made quick work of the suspension removal. We determined that these items had probably never been removed before- which is crazy since this chassis has over 300k miles on it. All of the clips in the trunk were still intact and the rubber covers were in place over the rear strut tops. Really cool to have a chassis like this that was never modified! I grabbed some photos of the only rust on the chassis while I was there to run them past my friend Mike at Detroit Drifting Company. 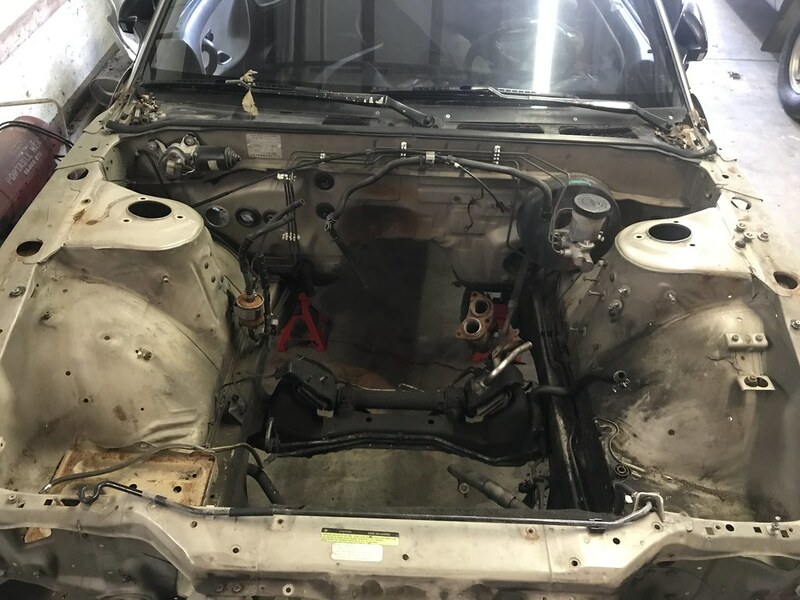 Mike did all of the welding on my black S13’s engine bay when I shaved it back in 2012 and also made a very similar repair to that chassis, so I am hoping to have him do the same thing to the coupe this spring before I transport it home. We’ll see what happens! 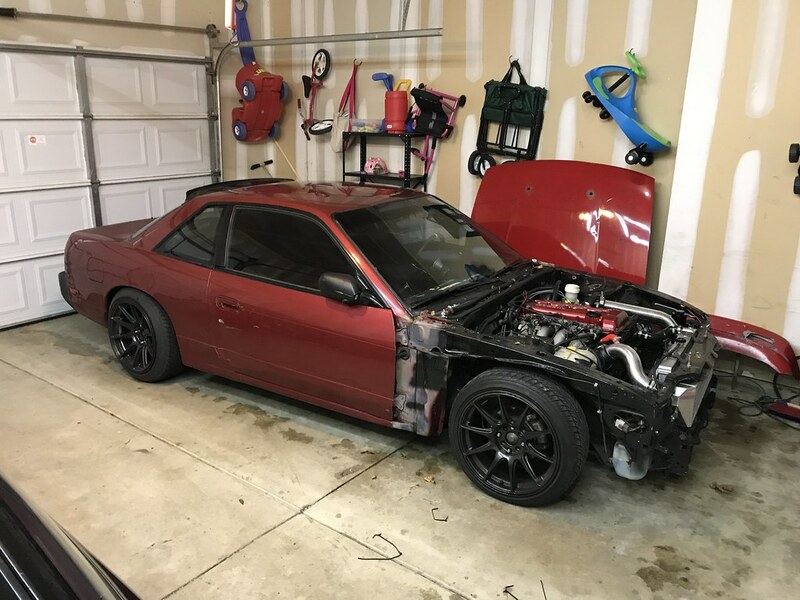 It’s unfortunate that there is any rust on this chassis at all, but the fact that the rest of the car is rust free and stock makes fixing it seem more than worth it. The rear quarters haven’t even been rolled! 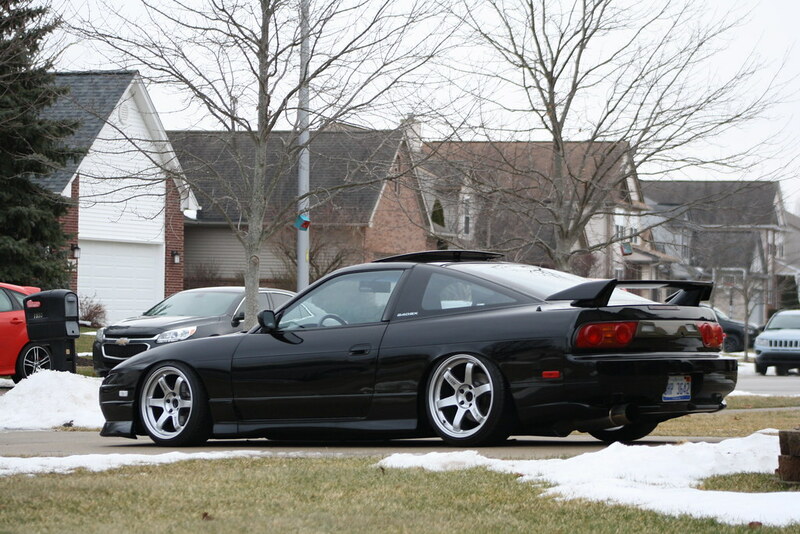 After retrieving the suspension and wheels, we grabbed some Taco Bell before tearing into Tim’s red S13 hatch. We managed to mate the engine and transmission before dropping it into the car- only to find that there was resistance when trying to turn the engine to install the CAS. 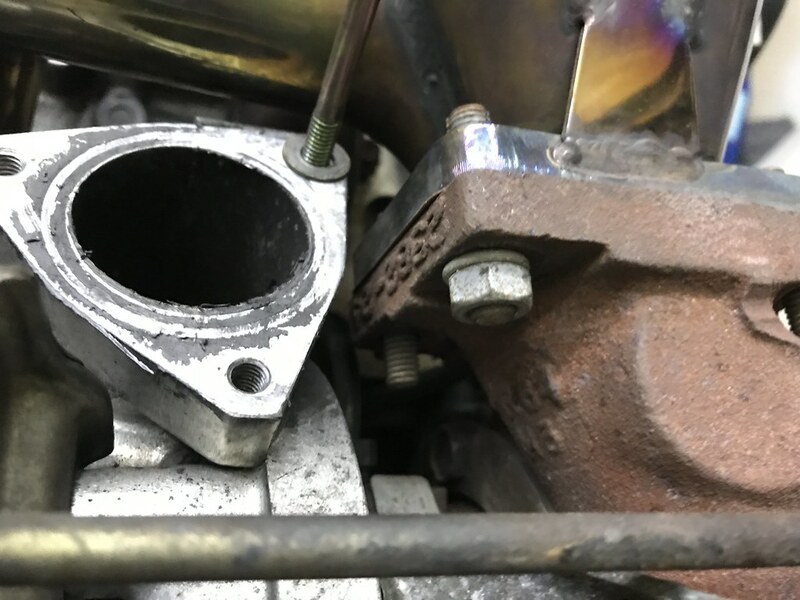 After pulling everything back out, we found that the slave cylinder bolts were contacting the clutch when trying to rotate the engine. Since the slave was not installed, the bolts were threaded too far into the transmission. A stupid error, but at least it wasn’t something more serious! It was good to make some progress on Tim’s car. Hopefully it will be running and on the road sometime this season. It would be nice to cruise around in the cars together. Fingers crossed this is the year! Back home again, I was able to install the suspension and wheels on the red donor coupe before posting the rolling chassis for sale. Hopefully I will be able to unload it soon so that I can free up some space in the garage. 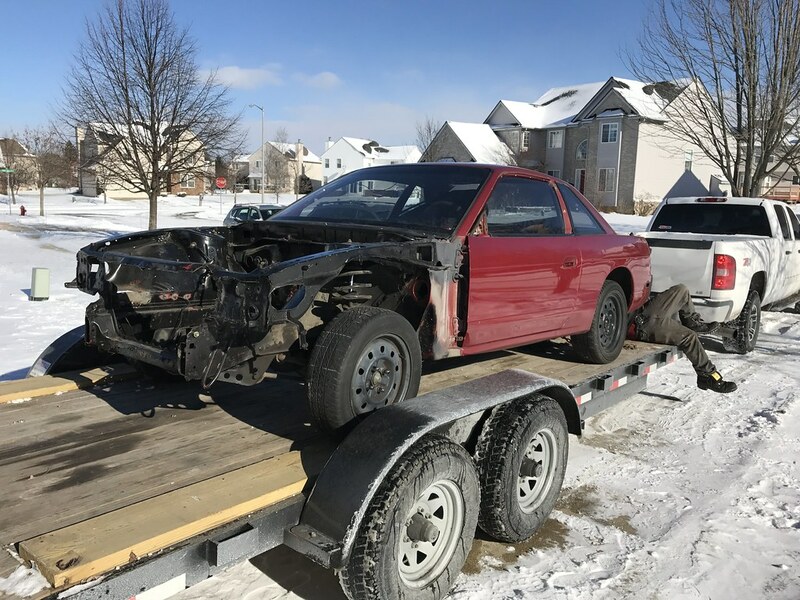 Unfortunately this car did not turn out to be “rust free” as the previous owner described it to be, but I am sure I can still find a good home for it. I had a feeling that was not the case when I bought it, but knew it had the components I needed for my own build. I picked up a couple of items I needed for the PS13’s SR20 refresh this past week including a stock shifter assembly (thank you to @Reneh240 for sending me this!) and a stock exhaust manifold from Tim. 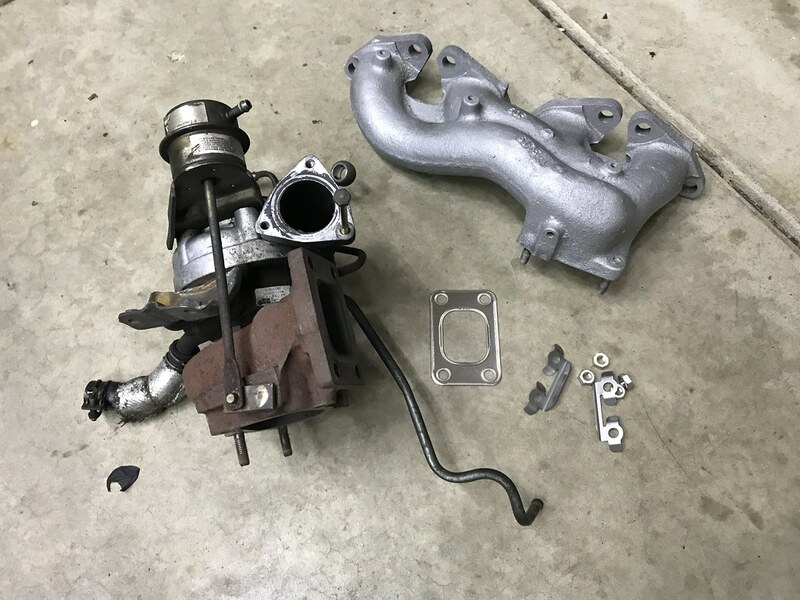 I’m planning to shoot the exhaust manifold with a quick coat of paint before installing it, along with a new factory manifold heat shield sourced from Japan (just like I installed on the SR in my black car) when it arrives. I’m still waiting on a few engine maintenance items from Japan, but I did receive another order of support items from the states including bolts for the oil pan, nuts and washers for the exhaust manifold, nuts and locking tabs for the turbo, shifter assembly and clutch slave boots, water pump studs and washers, and some other gaskets and seals for the transmission. I still need a few things to complete the refresh, but this is a great head start on beginning to put everything back together. My wife is going on vacation with some friends next week, so I have been taking a break from too much garage work to spend time with her and ensure that I have enough to do in the evenings while she is gone. I usually get pretty bored without her around after the girls go to bed so I’ve been trying to save up my projects to keep busy. If all goes well I should begin engine reassembly next week. This is the portion of the year where it begins to feel like winter will never end, even if there isn’t much snow. I’m trying to keep the motivation flowing! Thanks as always for stopping by! Have a great weekend. Well, after managing to post here every Friday for several months in a row, I finally missed one at the end of 2018. Things were very hectic celebrating the holidays with various members of our family, and to top it off we all took turns coming down with the stomach flu sporadically throughout our time off. Seeing one of your kids getting sick on Christmas morning is heartbreaking, but thankfully it was a quick moving bug and everyone made it out on the other side. I am happy to report that we are all back into the routine of school and work and everyone is more or less healthy at this point which is really nice. I haven’t spent a ton of time in the garage since my last update so this post will likely be pretty brief today. I did manage to spend some time thoroughly cleaning the engine a few nights ago and I am fairly happy with where it sits currently. I could probably spend a couple more hours to really fine-tune it and could probably even paint it, but I always prefer to leave the raw factory finish if I can. 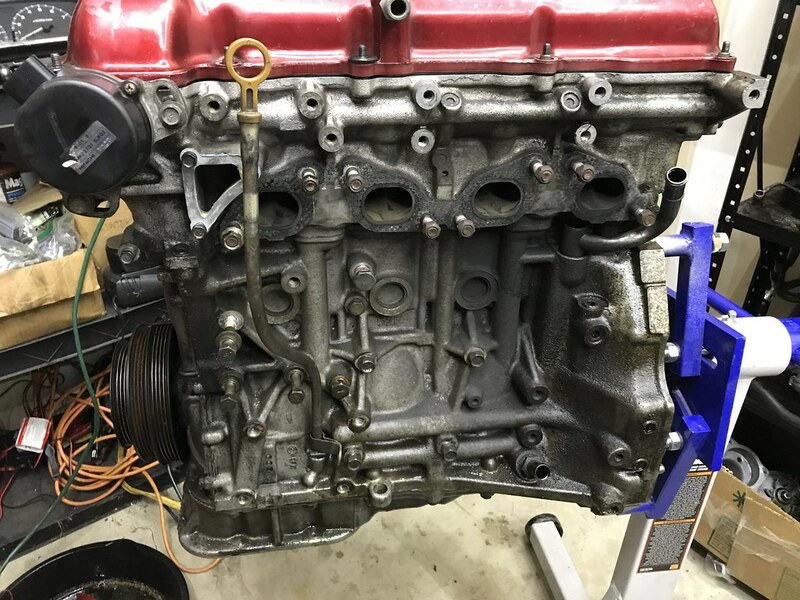 I’ll likely do just a little more touch up work after I remove the crank pulley (I realized my pulley removal tool is bent so I need to replace that this weekend) and then I can begin to reassemble everything with fresh gaskets and a few replacement components. I’m looking forward to getting it back together! Prior to cleaning- pretty messy, but could probably be worse. Progress so far. Not perfect but a whole lot better! I can’t wait to replace that unsightly FRAM filter. 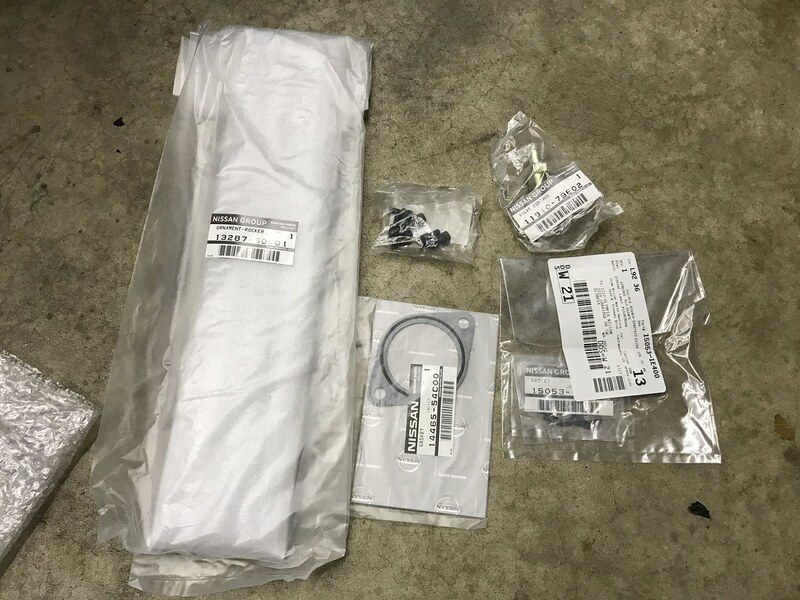 A few more maintenance items arrived this week from NissanParts.cc including an oil filter, stock oil pan, water pump, S14 oil strainer, and an S15 seven layer exhaust manifold gasket. 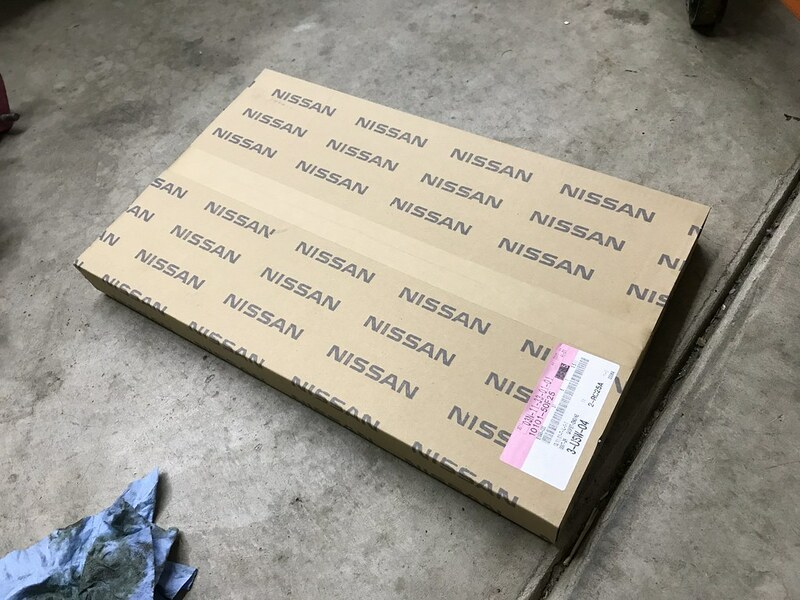 Another order from Nissan should be here this weekend with small hardware items needed to reinstall both manifolds properly. 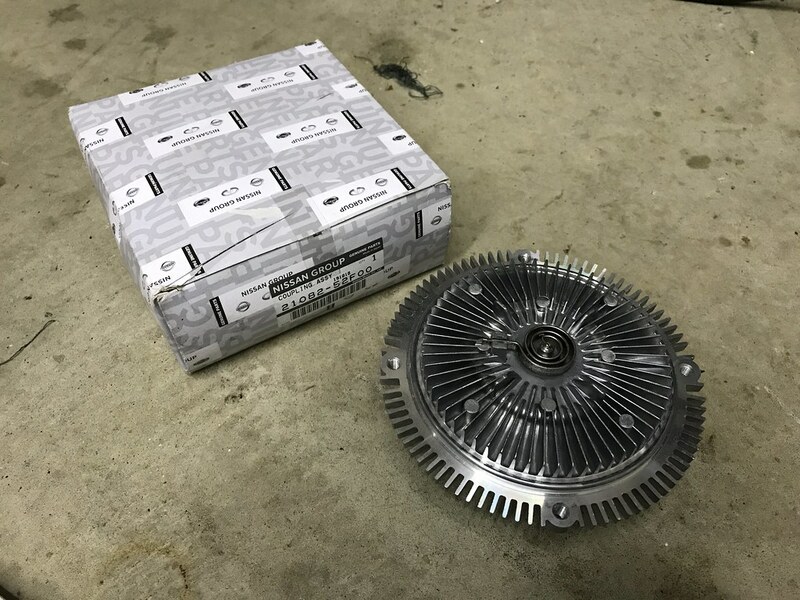 I also received my OEM Nissan clutch fan coupling and shroud. 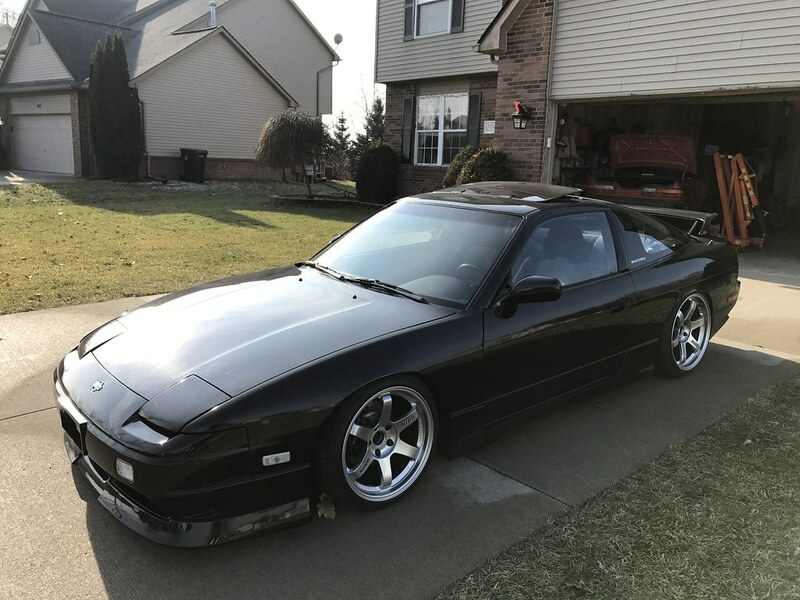 Say what you will about the factory clutch fan setup, but I have never had an issue with overheating while running this setup in my other S13 over the years. It’s so simple and hassle free! Can’t beat it for a street setup in my opinion. I’ve had to delay my trip to Tim’s house several times in the past couple of weeks due to conflicts, but I should finally be heading out to see him tomorrow. I am planning to grab the stock suspension and steel wheels from my champagne coupe so that I can get the red coupe chassis in rolling condition to finally be able to sell it. I am really anxious to get that car out of my garage and put Alicia’s van back where it belongs. 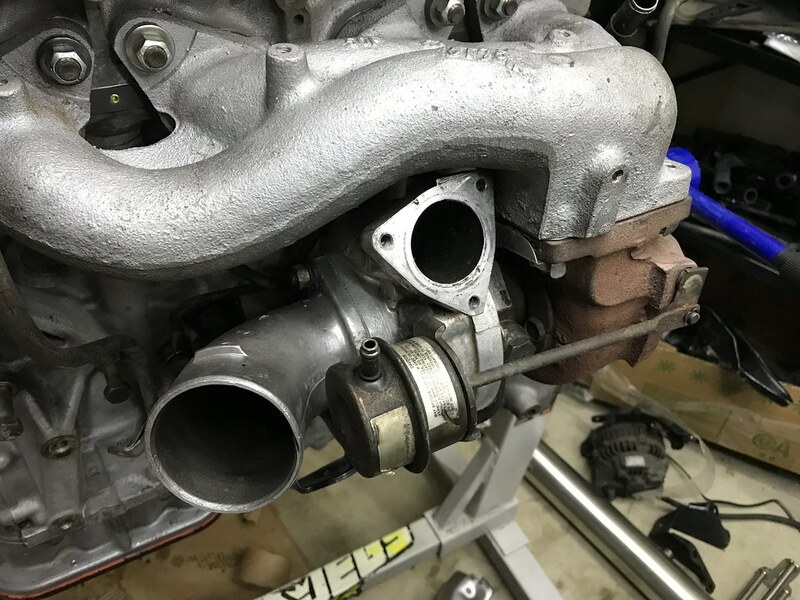 I’ll also be grabbing a stock exhaust manifold from Tim to use on my SR20 in place of the Megan tubular manifold that came with the engine. That’s about all I have to report for now! I hope to make good progress putting the engine back together next week. It’s not really a rush in any way, but I have been enjoying getting a chance to work on it. Thanks as always for stopping by and Happy New Year! I’m happy to report that the motivation continued to flow in my garage last weekend. On Saturday Morning Hattie and I lifted the new SR20 onto the engine stand and got it secured. 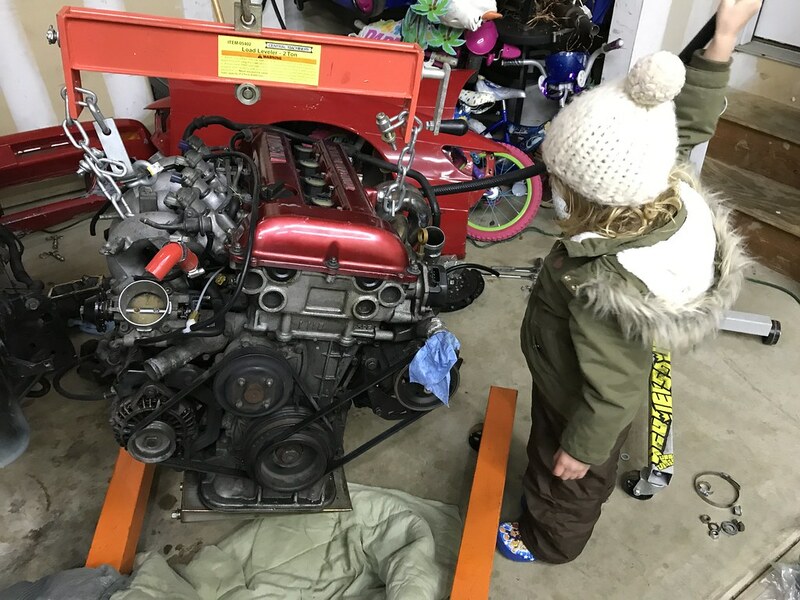 All of my daughters show some interest in car projects, but Hattie really seems to like using tools and learning about working on cars. 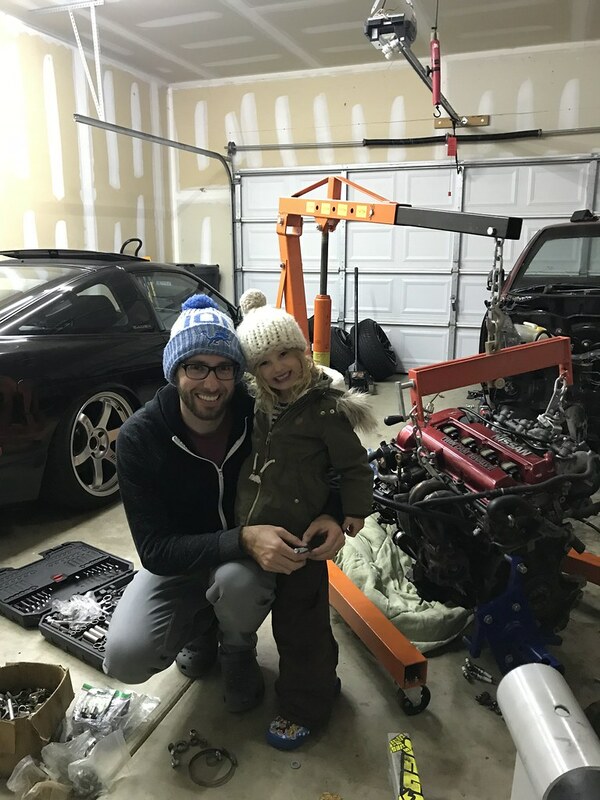 She loses interest of course (she’s only 4 after all) but I always enjoy when my kids want to hang out with me in the garage. I do very little to push them into liking cars because I want them to do their own thing in life, but I try to include them if they show some interest. 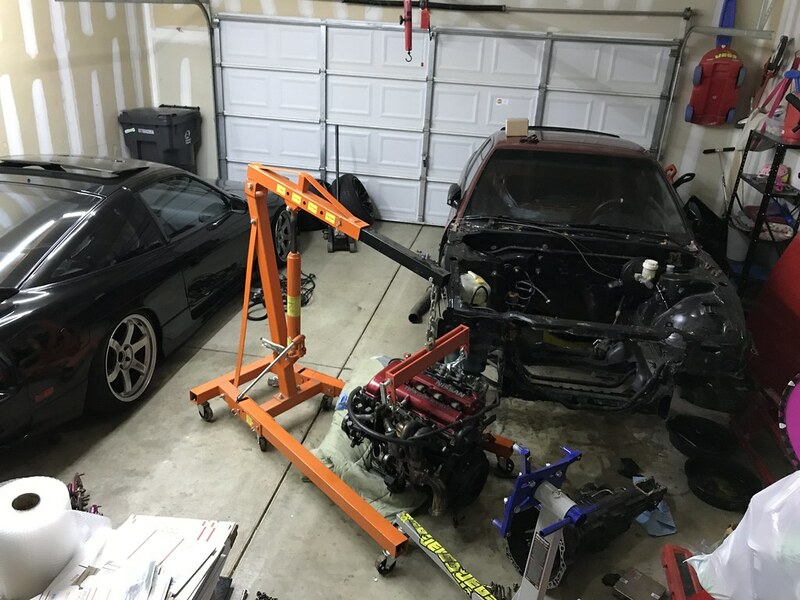 I decided to take a short break from removing items from the donor chassis and work on tearing down and inspecting the SR20 drivetrain that will eventually end up in my coupe build. I spent a few hours removing everything from the engine to repair it for a refresh. It’s really nice working on an engine I am familiar with (probably the only one I am very familiar with honestly) because it makes things move a lot more smoothly. Before long I had the engine torn down as far as I’d like to take it. My plan for this engine is very simple and more or less identical to the process I used to refresh the other SR in my hatch. I’m planning to install a full gasket kit and other maintenance items like a fresh water pump and thermostat. Everything will be thoroughly cleaned up and I’ll replace all of the rubber hoses located under the intake manifold. 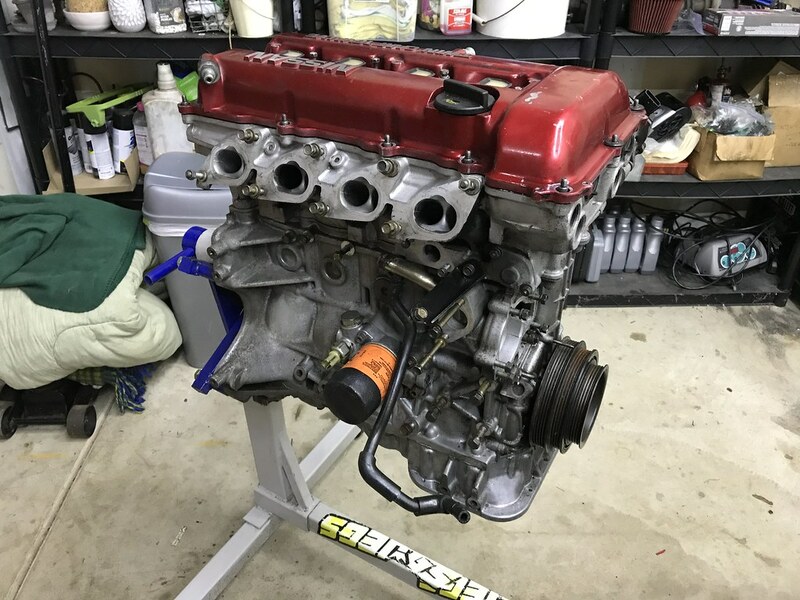 I’ve elected to install a stock turbo manifold and oil pan in place of the Megan and Tomei units that came on the engine as it makes the most sense for what I plan to do with the car- cruise around town. I’ll get into more detail about the engine refresh in a future post and try to include some part numbers that people might find useful for their own SR20 overhaul. Some of the things I found when taking the engine apart were fairly comical. 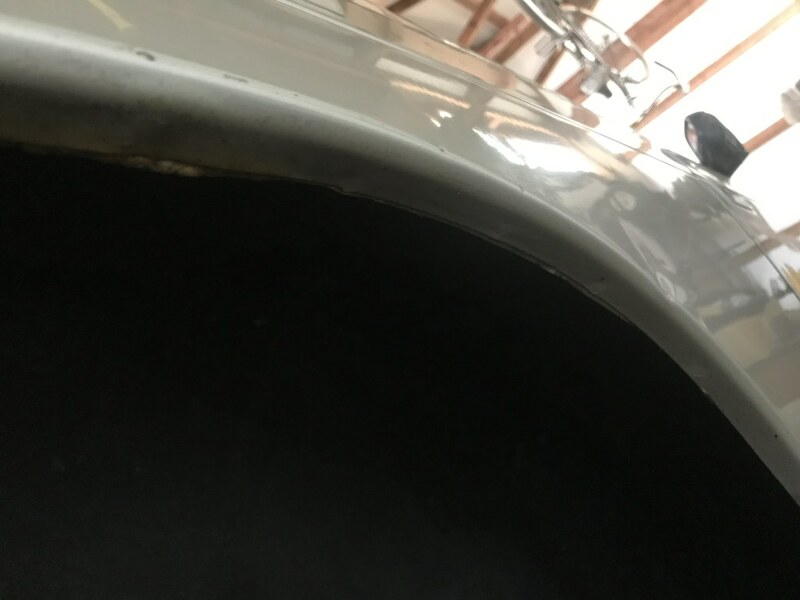 Nearly every portion of the exhaust side was missing 25-50% of the bolts needed to secure everything. Again, I am very thankful I made it home in this car without breaking down. The engine seems to be in relatively good shape from what I can tell though- it just seems like things either weren’t maintained all that well or were installed without a lot of attention to detail. 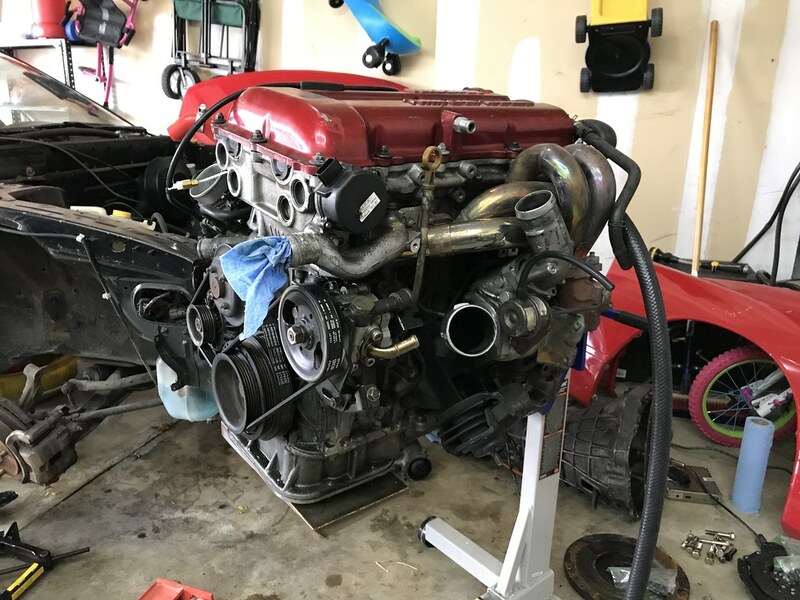 In any case I’ll be sure to get everything fixed up before installing this engine into my coupe shell. 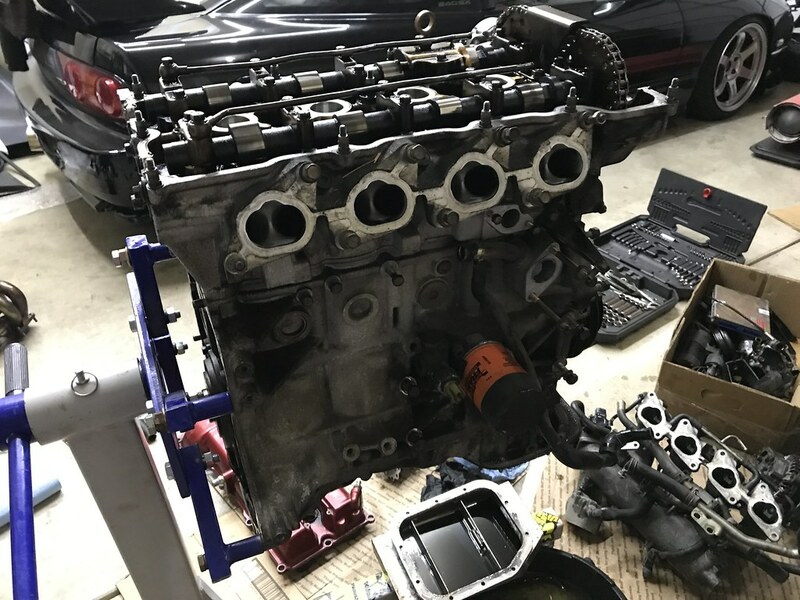 After the engine was torn down, I finished removing the remaining items from the donor chassis to get it ready to be sold. I’ve sold about 50% of the parts from the car that I don’t need, but things have slowed down a bit due to the holidays. I am hoping to move out the rest of my inventory in the new year. Thankfully the weather has been mild and we haven’t had much snow to speak of so that leaving my wife’s van outside for a couple weeks hasn’t been a problem. 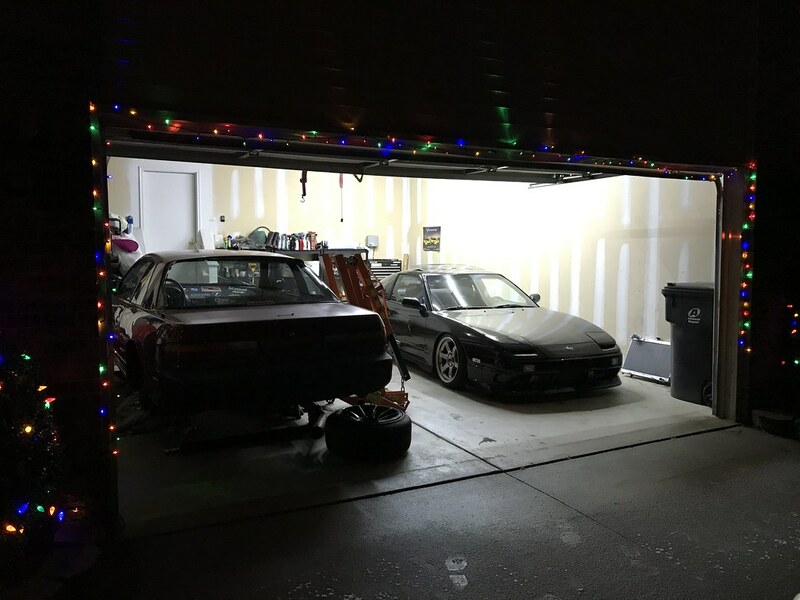 Today is the first day of my time off for the holidays, so my plan was to travel out to Tim’s house to hang out and possibly help him with the SR20 for his own build (not that he needs much help as he is a mechanic by trade.) 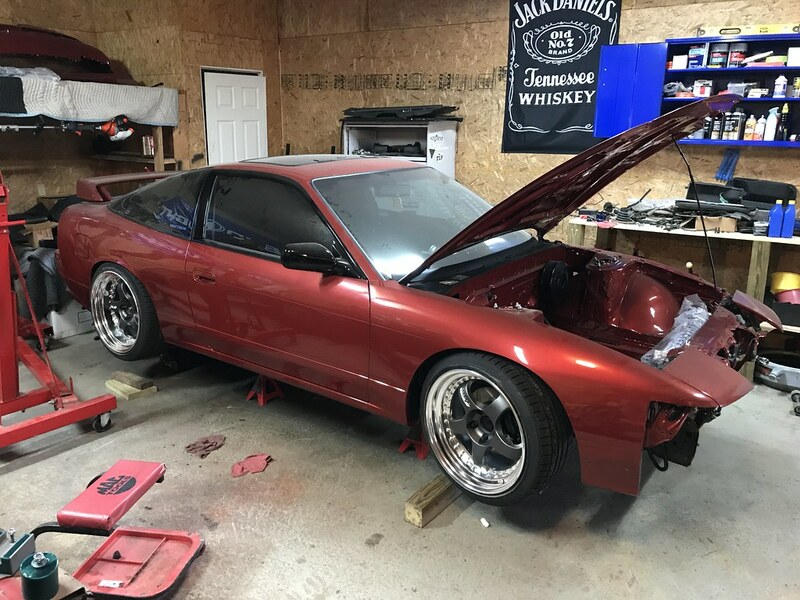 I also need to remove the stock wheels and suspension from my coupe chassis to install on the donor car in order to get it ready to be sold. Once I have those items, I should be able to throw them on the car and hopefully get it out of my garage ASAP. However, my oldest daughter woke up with the flu, so that plan has been put on hold for a week or so until I’ve got time to try again. I’ll likely continue to clean up my SR in the mean time when I have a minute next week during the holidays. Well, that’s all for today- a relatively quick update, but I am sure everyone else is just as busy with the holidays as I am. I’m really happy with the progress I have made so far on this project though! I’m looking forward to continuing the momentum into 2019. I hope everyone has a Merry Christmas next week! Thank you as always for stopping by. Take care! Things have been picking up steam for me since my return from vacation in Florida late this past Saturday night. My garage has probably seen more activity in the last week than it has in the last couple of years combined which is pretty exciting. Tis’ the season… to play with junky old Nissans! I didn’t have much time in the few short days between purchasing my new donor car and leaving for Florida, but I did manage to get a few things removed from the car before we left on our trip. 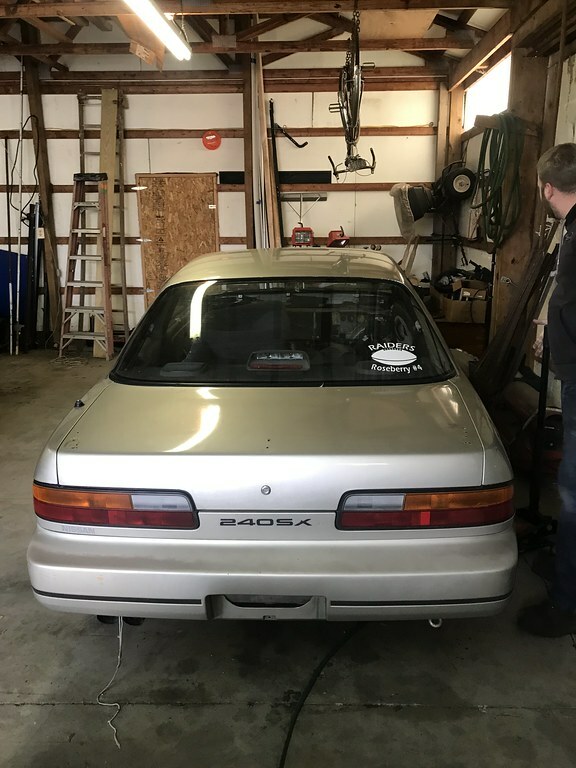 It was tough to bring the car home and immediately need to leave for eight days, but I wanted to snag it before any more snow came down or someone else could purchase it. I snuck into the garage in between packing and managed to remove a few simple items like the Silvia front end, replica Bride seats and Buddy Club seat rails, Corbeau harnesses, Mishimoto radiator fans, Circuit Sports catch can, and even a brand new Cusco rear strut tower bar that was mounted in the trunk (this was a surprise to me since it was not listed on the for sale post for the car.) This allowed me to list some of these items for sale from Florida and ship them when I returned home. 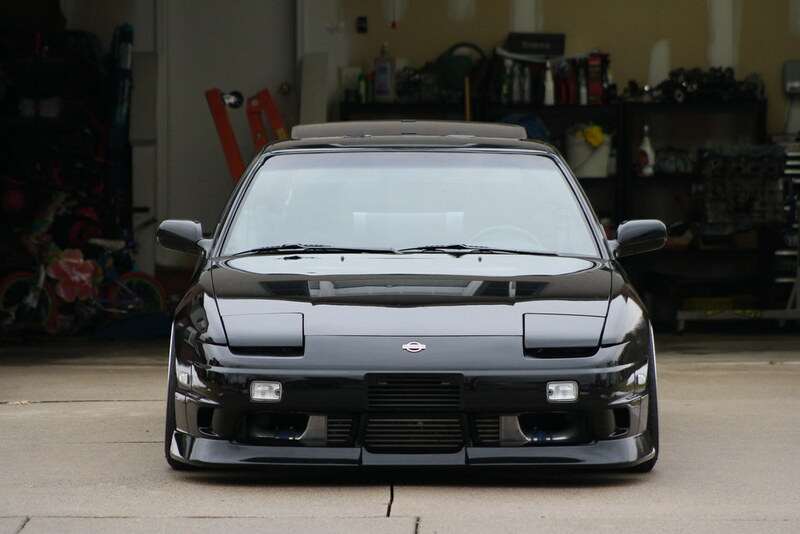 This car is your stereotypical S13 drift car build in every sense of the word. When I removed the front end, I found that both headlights and corner lights were held in place with one zip tie each. 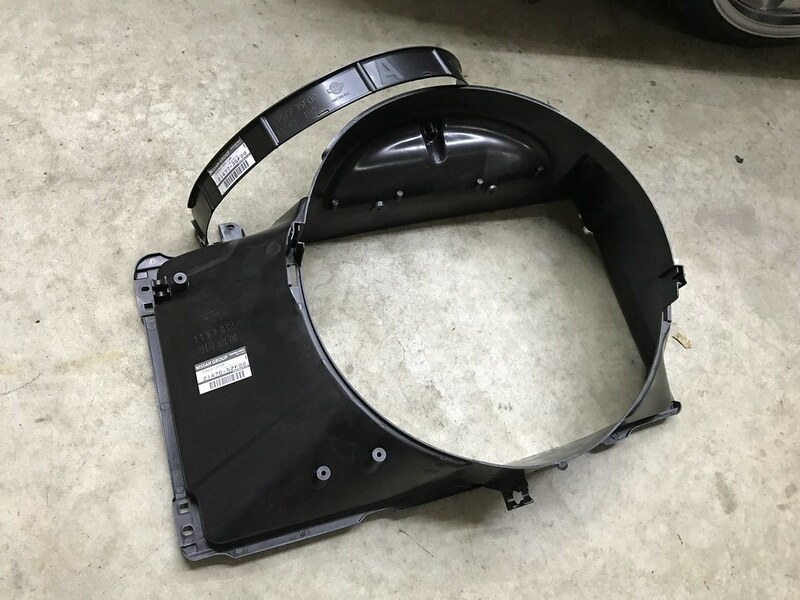 There were no PS13 brackets for headlight mounting and the front bumper was held in place with two bolts from the crash beam to the chassis. 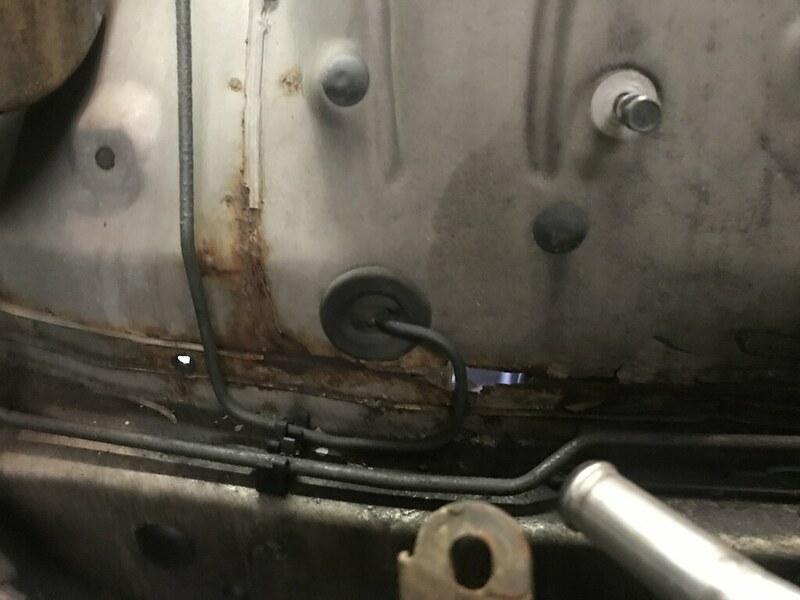 There was no factory hood latch installed, so someone decided to drill into the nearly mint OEM Silvia hood for hood pins. 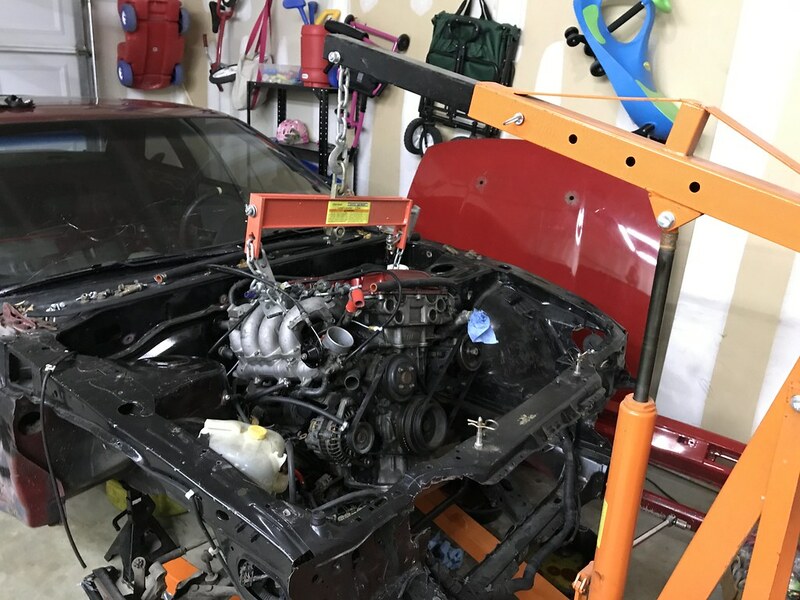 It was clear that not a lot of energy was put into assembling the car, but it felt good to confirm that a majority of the parts were there to meet my original goal of getting my money back out of the car. Upon returning home from Florida, I began to really tear into the car. I put it up on jack stands and removed and sold the Parts Shop max high mount intercooler. It’s a really nice kit and the engineering behind it makes sense, but it’s not really the look or style I am going for on my build. 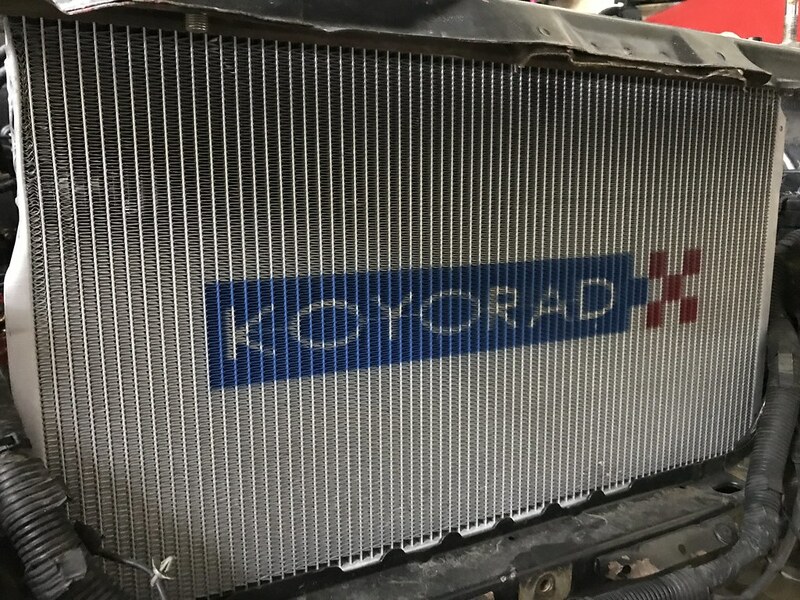 I did find a like new Koyo radiator on the car (despite the ad saying it had a Mishimoto radiator) so that was a nice surprise as I planned to purchase one eventually for the build anyway. I also elected to remove and sell the Chase Bays power steering kit from the car. I’m not sure what I will end up using for a power steering setup for the coupe, but we’ll see what happens. 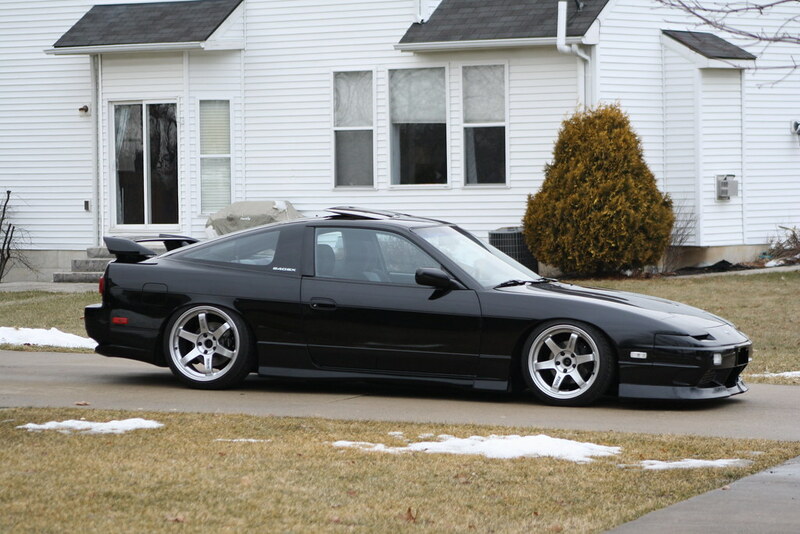 After having the car in the air, I pulled the XXR wheels, EMUSA coilovers, and Godspeed rear suspension arms. 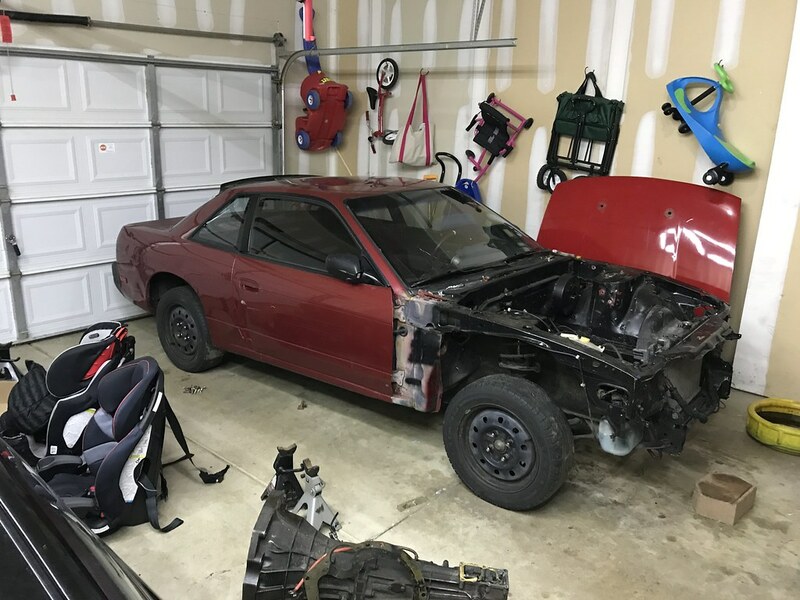 I’ll likely install the stock suspension and steel wheels from my project coupe to sell this car as a rolling chassis. 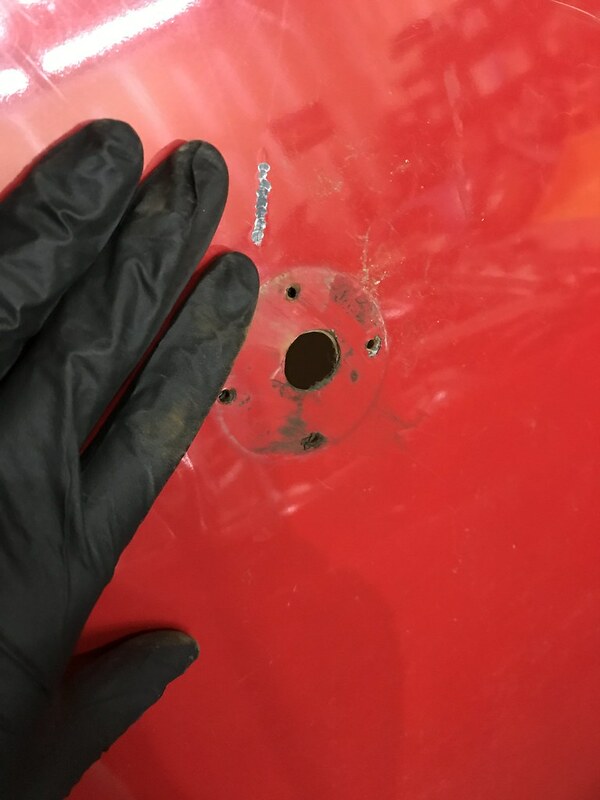 It was during this process that there was more rust on the car than I was led to believe (I was told there was none and saw pictures of the frame rails, but I assumed that was probably not likely.) Upon closer inspection, portions of the floor and the frame rails have definitely been repaired. This was a bit disappointing, but I should still be able to find a buyer for the chassis. At lunch time yesterday I did a quick compression test on the new SR and things seem to be in pretty good shape from what I can tell. I’m planning to go through the engine and do a very light refresh, so hopefully applying the same maintenance to this one will treat me well like it has in my other car. Speaking of the other car, it was fairly nice out while I was home yesterday so I decided to let the hatch run and pull it out of the garage for a little bit. It’s only been about a month and a half since I put it away but I definitely miss driving it. It is nice to have it sitting there while I work on this car though to remind me of what the end goal looks like. 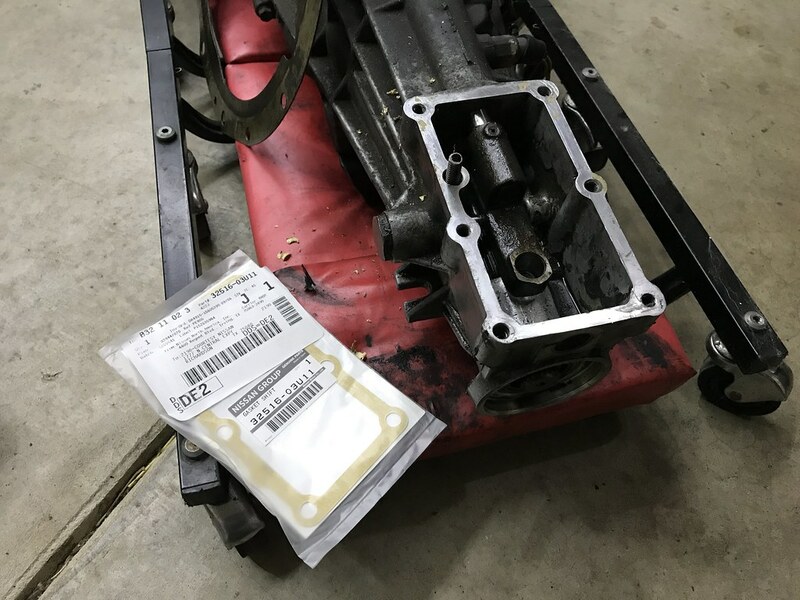 My OEM gasket kit arrived during the compression test yesterday- the first piece of the puzzle for refreshing the new SR20. I am really looking forward to having the engine on the stand and cleaning everything up! 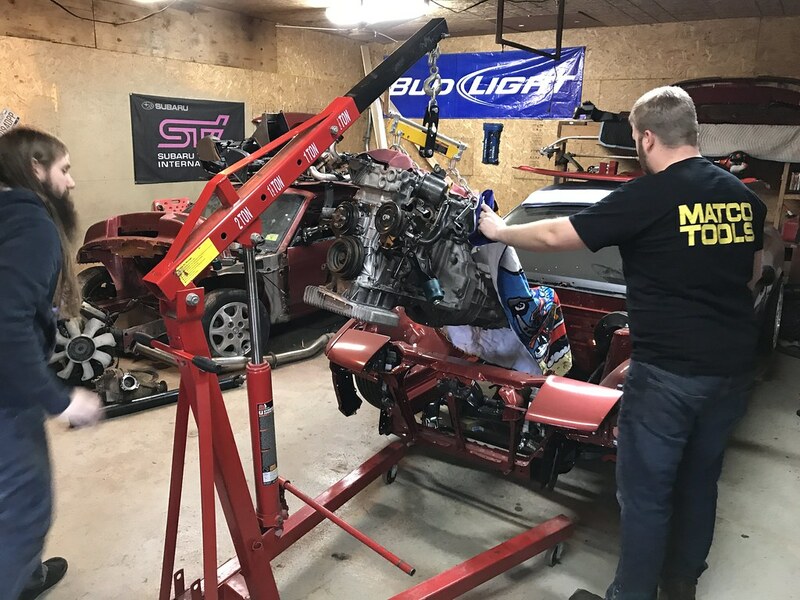 After making steady progress removing parts from the car and selling them through the week, as well as completing the compression test, I was finally able to remove the drivetrain from the car late last night. It’s crazy to me how many nuts and bolts are missing in important places on this car, including the turbo outlet pipe, turbo manifold, and O2 housing. The more time I spent under the car, the more fortunate I felt that I made it home in one piece driving this thing down the highway! 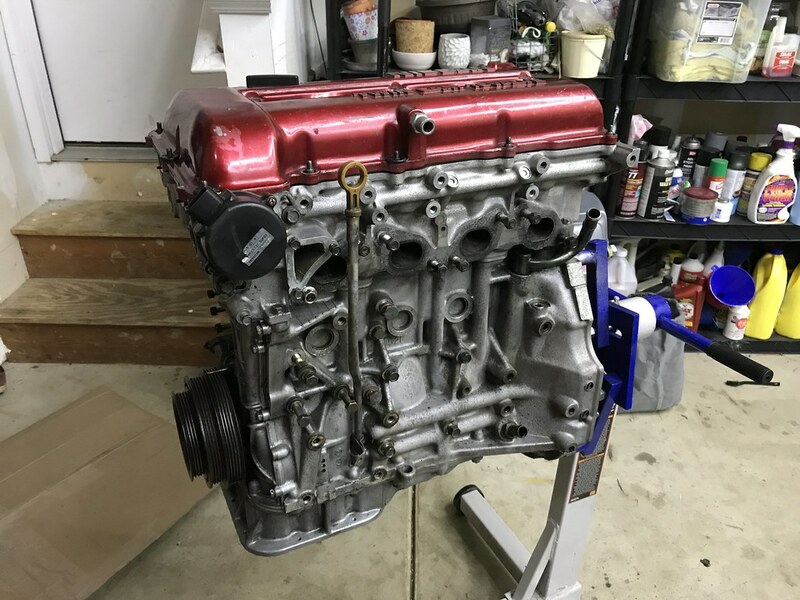 I pulled the transmission off of the engine late last night and am planning to remove the clutch and flywheel to put it on the engine stand tomorrow morning. 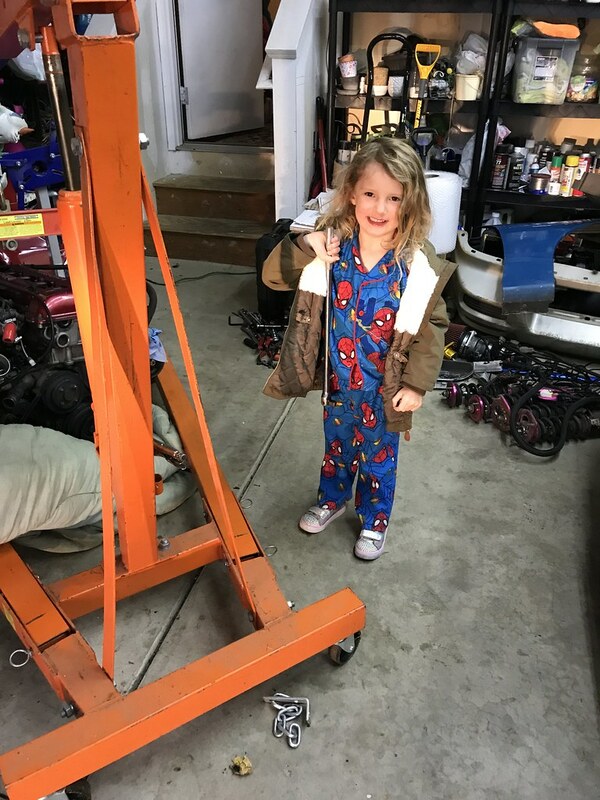 My four year old daughter Hattie has shown a lot of interest in working on cars and really wants to use the cherry picker, so I decided to put that off until the weekend so that she can give me a hand. Minion #2 reporting for duty. 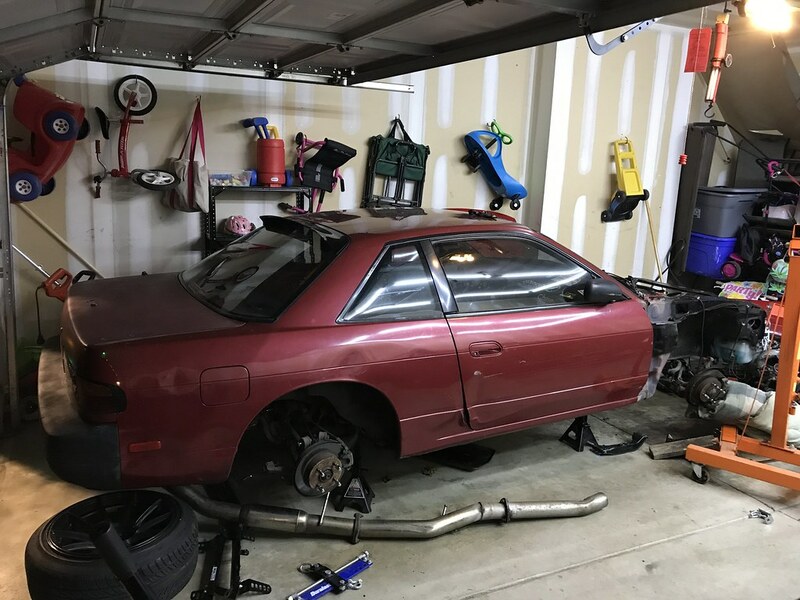 Hopefully you’re as excited about this progress as I am- it feels great to be out in the garage and doing some serious work again! I’m looking to continue to stay motivated and make some more progress with the part out in the coming weeks. Thankfully the weather has been pretty mild without much snow so parking my wife’s van in the driveway has not really been an issue. It will be great to get the donor chassis out of the garage and put the Sienna back in until spring time. Thank you as always for stopping by and have a great weekend!